You can contact the photographer on Flickr or via email for licensing information. Images have been licensed under Creative Commons CC BY 2.0. Check out Occupy Together, a new site listing occupation movements across the country. Watch the Global Revolution livestream. 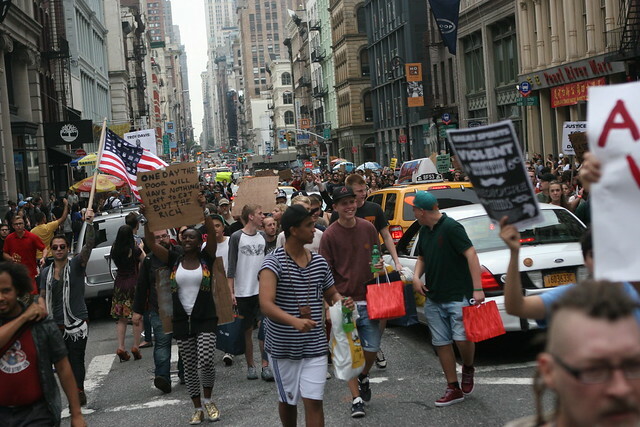 Follow Evan Fleischer for a steady stream of news from the Occupy Wall Street movement. This entry was posted on Wednesday, September 28th, 2011 at 11:23 pm. It is filed under #OccupyWallStreet, Activism, MiseryXchord, Politics, Talking Points, World and tagged with #occupywallstreet, 2011, Day 7, nationde, Occupy Wall Street, Paul Weiskel, photojournalism, police brutality, politics, Protest, wide. You can follow any responses to this entry through the RSS 2.0 feed.